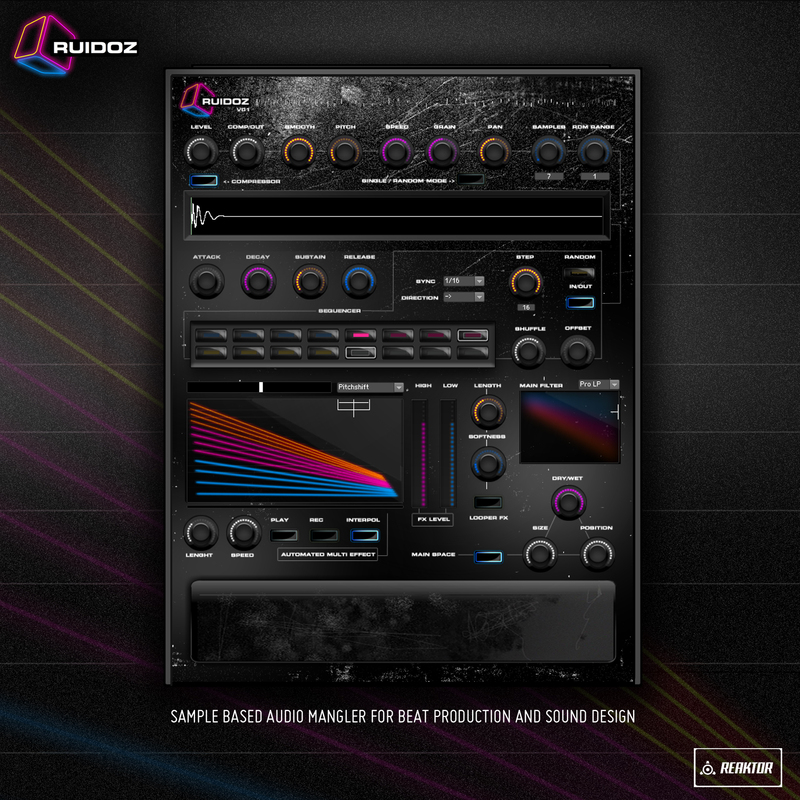 RUIDOZ° V.2 – Beat generator and sample mangler. 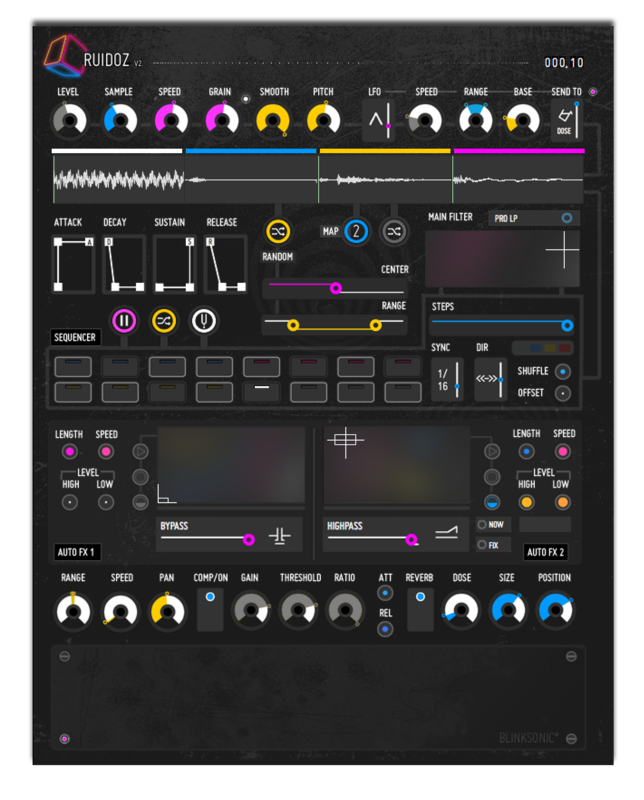 – > A smart sound design instrument for creating original sequences and a wide variety of sound textures. – > No more static rhythm and stated percussion loops… Just (des)humanized the basic pulse and the ambience of your beats with random function & a collection of 340 one shot samples. -> Over 300 original glitchy beats, noisy percussions rhythms and either soundscapes, HUD sounds, semi harmonic phrases and mechanical riffs included. -> Load your own sample libraries. This percussive virtual machine could answer to your needs if you want to add originals and randoms colors to your music. It can take place on the background of your main beat (Kick+Snare) or is well suited for building a rhythmical base that will transform the atmosphere of your whole track, especially if you are looking for unstable grooves, wonky beats, multi percussion lines with the charm of an organic resonance. 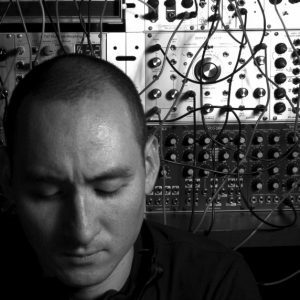 Genres : Electronica – Glitch Hop – Wonky – Trap – IDM – EDM – Minimal – Ambient – Cinematic – House – Minimal – Braindance – Drum n’ Bass – Dub Step. – Intel Core 2 Duo equivalent must be enough with 4 GB of Ram. To give an idea this ensemble has been created on a 2,7 Ghz Intel Core i7. – CPU usage : Around 11% with a 2,7 GHz Intel Core i7, 16G Ram. – An internet connection to download the files and potential updates. File Type : .ens and .pdf for the manual. Enjoy the modern, intuitive and compact graphic interface. 2 different views are available (vertical & horizontal). RUIDOZ° is well integrated inside any DAW workspace. 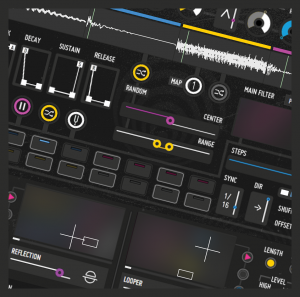 Sculpt the basic shape of your sequence with filter, auto pan, compressor, reverb, and ADSR enveloppe. Manipulate in real time the main signal with the 2 ” Auto FX” which includes 20 effects. Play and record the modulation of the 2 parameters available for each effects. with a XY pad. Create sample change flux with the random mode. A different sound is launched on every gate events received from a full featured step sequencer. Manage aleatory with fun and play with the unexpected! All the samples come from a huge collection of micro sampling and field recordings. RUIDOZ° comes with a consequent bulk of presets. 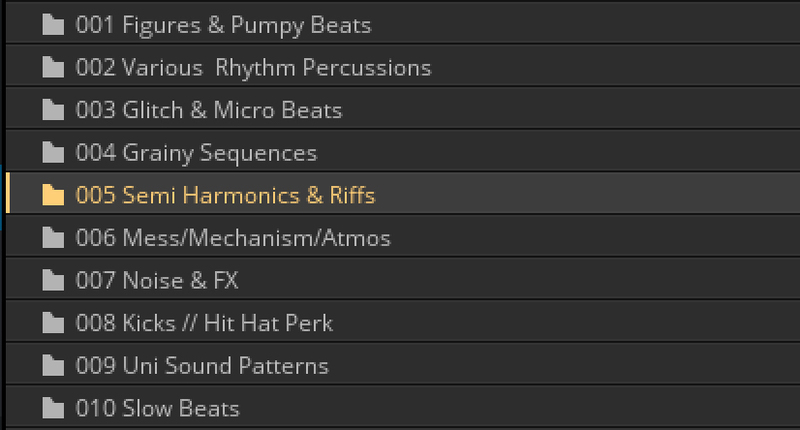 14 Banks and 365 snapshots in total, to get detailed examples of how it sounds and instant material for your productions. – Pitch Step Editor : Set different pitch values (-24/+24) on every steps of the sequencer. – Route LFO : LFO can now be routed to 3 others parameters than « Pitch » : Grain, Speed (Grain), Center (Random Mode) and Reverb (dry/wet). – External midi trigger : when the sequencer is on pause, launch RUIDOZ gate events from external midi message (keyboard, DAW midi clips, etc..). – Some prepared MIDI control : Control of the global pitch modulation with the Pitch wheel of your midi keyboard. The Modulation wheel is assigned to the sample selector. – Enhanced random function with the possibilities to adjust the range of randomization of the samples selection. – Control Pitch envelope with LFO. – 4 maps (instead of only 1). – Random map button (it’s getting really weird !). – Threshold, Ratio, Attack, Release parameters are now revealed and available. – Additional Auto Fx section with 8 new effects and instant launch of the effect with momentary button. – 4 sample engines with SPEED, GRAIN, SMOOTH, PITCH parameters. – 340 one shot samples embed in 4 maps. – 13 Banks and 354 snapshots. – Modulate PITCH value with a 4 shapes LFO (Pulse, Triangle, Sin and Random). – 3 random modes for Sample selection, Map Selection and Random Step. – List of effects : Scratch, Stutter, Pitchshifter, Bit Reducer, Ring Modulator, Distortion, Looper, UFO, Space, Reflection, Feedback, Resonator, Freq Mod, Flanger, Vowel, Phaser, Lowpass, Bandpass, Highpass and Reverse. – Main Filter with 7 modes and controlled by aX/Y axis pad. – View B with a compact interface, essential control elements, Bank and Snapshot browser knobs. 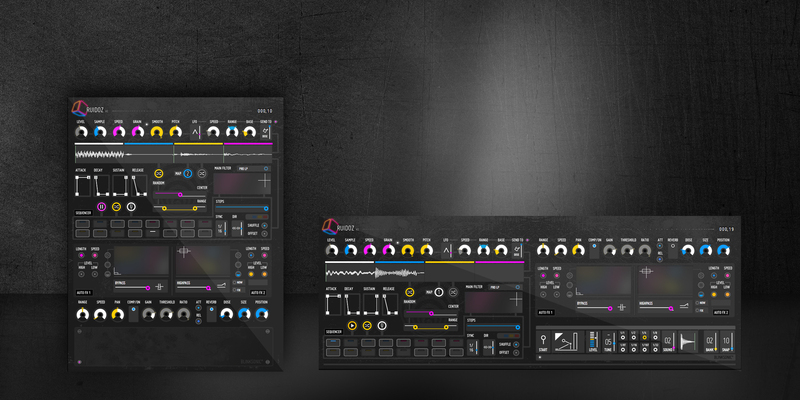 BLINKSONIC° instruments are developed using Reaktor 6, a powerful and customizable modular software. Since August 2017, all Blinksonic° instruments are formated to run with the free REAKTOR PLAYER and can be opened either standalone or as a VST/AU/AAX plug-in within your favorite DAW. 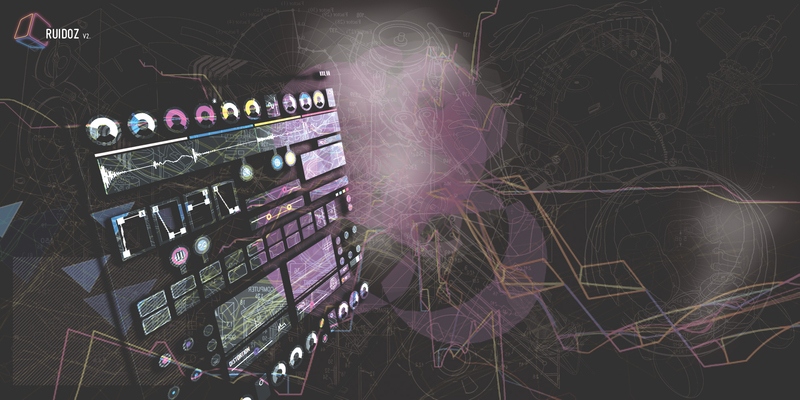 In short, it’s not necessary to have a full license of Reaktor 6 to use our instruments. 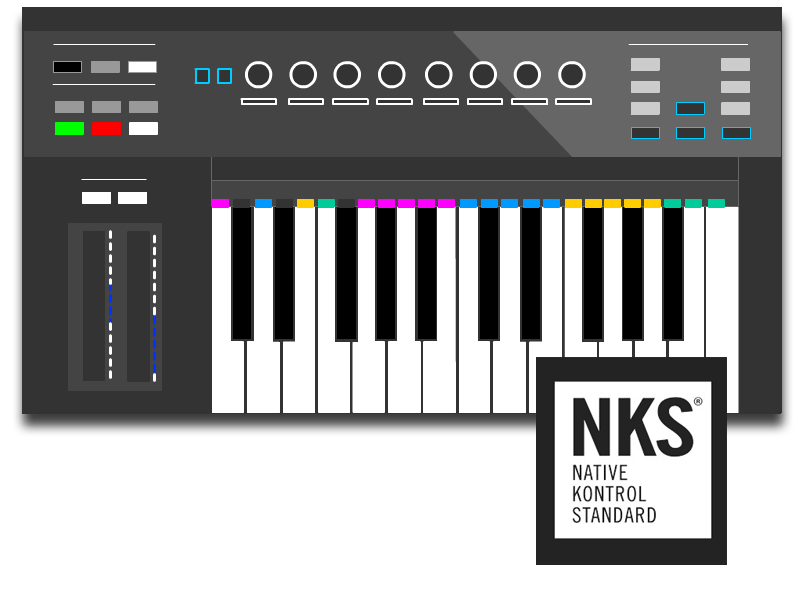 RUIDOZ° is NKS (Native Kontrol Standard) ready. This Native Instruments’ extended plug-in format allows for intuitive and seamless interaction between plug-in instruments and KOMPLETE KONTROL and MASCHINE hardware. A custom integration designed have been prepared to work with the Native Map and Light Guide. As much it’s a sound design tool, RUIDOZ is lightweight and really oriented for intensive live action. All the control have been thought for a direct access on sounds and modulating the audio source in real time . Since version 2.1.9, you can add a basic techno/electro Kick drum to your RUIDOZ° loop. This feature hided behind the bottom faceplate, provides an optional Kick Step Engine with 8 raw files. In this section of the GUI, on the bottom-right, it’s also possible to select the current snapshot & bank. 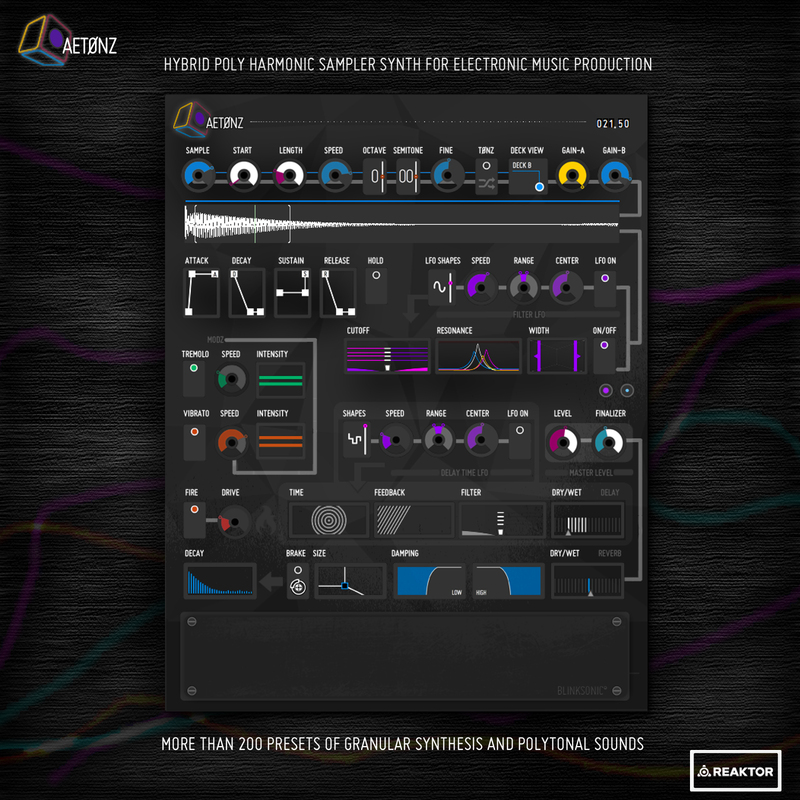 RUIDOZ° takes advantage of the “Grain resynth modules”, a primary macro which enables to embed external samples. Use the Reaktor “Sample Map Editor” for importing your own sound libraries. It’s easy as dragging files from your browser inside it. If you want to know more, it’s fully explain in Reaktor User guide. RUIDOZ also got its melodic gemini : AETØNZ°, an Hybrid Polyharmonic Sampler/synth based on the same granular and random engines. 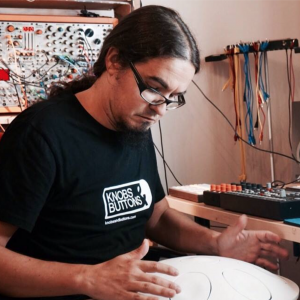 Music producer, Monome Community, Barcelona, Spain.